For Fuzz’s second birthday, I decided to make a Hello Kitty cake. So being the combination neurotic mother/obsessive baker that I am, I auditioned various cake recipes, tested out icings, and of course, practiced carving the cake into shapes. Each new and improved Hello Kitty cake would go to Todd’s office, where he’d place it in the break room for his co-workers to enjoy. At first, they were hesitant to cut into such a cute cat cake, but by the third cake, they had lost all reticence and had even begun a savage little game of keeping the cake knife lodged in Hello Kitty’s forehead. On the day of the party, we gathered in the party room of “The Little Gym” which had been lovingly decorated by Little Gym employees. My energy had gone into the final Hello Kitty Cake. Then tragedy. Ten minute before the guests were due, I dropped the Hello Kitty cake face down on the floor of the Little Gym party room. I remember the moment of silence that ensued, and Todd tells me now that he and most likely, the Little Gym employees were waiting for a crazy-mother meltdown. Little did they know, when the cake hit the floor, I felt a wave of calm. I asked Todd for the keys, drove next door to the grocery store, and bought a bakery cake. In the end, the party was fun, the grocery store cake was great, but the real star of the party (besides Fuzz) was the sidekick cake I’d made for the adults – a cheesecake. In hindsight, maybe it was good that Hello Kitty wasn’t there to detract from this cheesecake which all the adults said was the best cheesecake ever. I made this again today and as usual, it turned out perfect, despite the massive crack I get every time I make this cheesecake. I do have some no-crack cheesecake recipes, but this particular recipe is tastier than the others and the crack just becomes a non-issue. At least if you top it with something, which is what I did today. Topping: Whatever you want to use to cover the crack. Prepare crust. Mix crumbs, sugar, and butter and press into bottom of a 9 inch springform pan. (I like to line my pan with a 9 inch round of parchment). In large bowl, with mixer at medium speed, beat cream cheese just until smooth; slowly beat in sugar, scraping bowl often with rubber spatula. Add extracts, orange juice, cream, flour, egg yolks, and eggs; Stir until smooth. Do not beat the eggs, just stir them and try not to whip any extra air into the batter. Bake cheesecake 12 minutes. Reduce oven heat to 300-degrees; bake 35 minutes longer. Turn off oven; let cheesecake remain in oven 30 minutes. Remove cheesecake from oven; cool completely in pan on wire rack. Cover and refrigerate at least 4 hours or until well chilled. When cheesecake is firm, with spatula, loosen pan side from cheesecake and remove cake from pan bottom; slide onto serving plate. Pour topping over center. If you used parchment, you can gently pull the cake onto a beautiful serving platter. Otherwise, just serve it off the pan bottom. How do I change it to a 12″ cheese cake recipe? made this yesterday…no water bath, massive crack but nothing but compliments! my first cheesecake! Thanks for a great recipe! I have also come up with a solution for leaking springform pans. I use my standard springform, but slide it into a round silicon baking pan, then put the silicone pan in a water bath. I got the baking pans as a gift and as a rule, hate them, but the 9 inch pan is just flexible enough to stretch around the clasp on the springform. It is neat, easy, and foolproof. Though just one question…is this cheesecake like a sponge cake? Delicious! I made it yesterday….my very first cheesecake….EVER….and it turned out perfect!! Even though I’m happily married, my wife’s given me permission to kiss you! Your tip about the Reynolds Turkey Bag was fantastic…I just took a cheesecake out of the oven and the springform pan is BONE DRY. Without a doubt, this is the way to go. 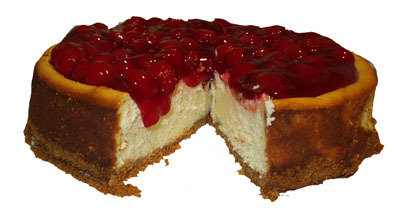 Thanks again…I really love baking cheesecakes, and this fool-proof method will add years to my life, as I will no longer worry that all my hard work was for nothing. Thanks SO much for that tip. It’s so simple, but practical….and why didn’t anyone think of that???? You’d think it would be in a cooking magazine or something. You’ve inspired me to go make something in a water bath. Thanks for the tip. I love your recipes and your stories! I have a suggestion…for your cheesecake, a guarantee to NOT crack! And not leak!!! WOW! The secret as you already know is the water bath and it’s not because of extra moisture! It’s because water boils at 212 degrees and the oven of course is hotter, so imagine this… the inside of your cheesecake is boiling so to speak and it is cooking at a nice 212 degrees, while the outside is being subjected to extreme heat! And it is cooking way faster, that causes uneven baking and, well, cracking! So a water bath really is necessary to cook your whole pie evenly and guarantee to not crack! So here’s my secret, I got so sick of foil leaking and ruining my cheesecake that I figured out a way to fool proof this step! I take a large Reynolds Turkey or Chicken cooking bag, you know the clear one you love and use at Thanksgiving for your big bird! I use the really big one for 12 inch cheesecakes and the smaller chicken size will fit an 8 or 10 inch springform pan. You just set the springform pan in the bottom of the bag and roll down the sides until it is just above the pan now you can fill hot water around the cheesecake and guaranteed to not leak! Just be careful of getting the bag close to the top oven element, it will melt and stick to your element (lesson learned the hard way!) 🙂 And you can reuse it for the next Cheesecake attempt! It doesn’t touch the food, it just keeps the water from getting into the pan! After much perusing of your archives, I’ve decided that this will be the item that I prepare for my first potluck dinner here at Stanford. I think I’ll see how the raspberries are this time of year and make a topping out of those. Thanks for stopping by Cookie Madness. I think you’ll like this recipe. If not, let me know. Sometimes the largest disasters are where we (I) are most calm. I probably would have had a meltdown only over something trivial, like a mistake in the frosting. Great story and yummy looking cheesecake! I really must applaud your calm in the face of disaster! Such is the way of the warrior. Did you get a picture of the cake before it went on its final journey? This cheesecake sounds great, especially with the heavy-handedness of the citrus juices.